Lately we have noticed an increased number of articles (on the Internet, ironically) encouraging us to disconnect and spend less time inside staring at a screen and more outside in nature. Motivated by public health problems, such as obesity and depression, scientists are focusing their efforts on how nature affects our brains and bodies (take a look at National Geographic magazine's latest feature on this here). With this in mind, we've put together our six favourite walks in the countryside around La Cazalla, and you don't have to be an Olympic athlete to enjoy them. Go on! Close your laptop, switch off your phone and rejuvenate your senses in the wild. This is a lovely easy walk direct from the house that can be adjusted with a couple of different options, depending on your desired length of walk or preferred activities. 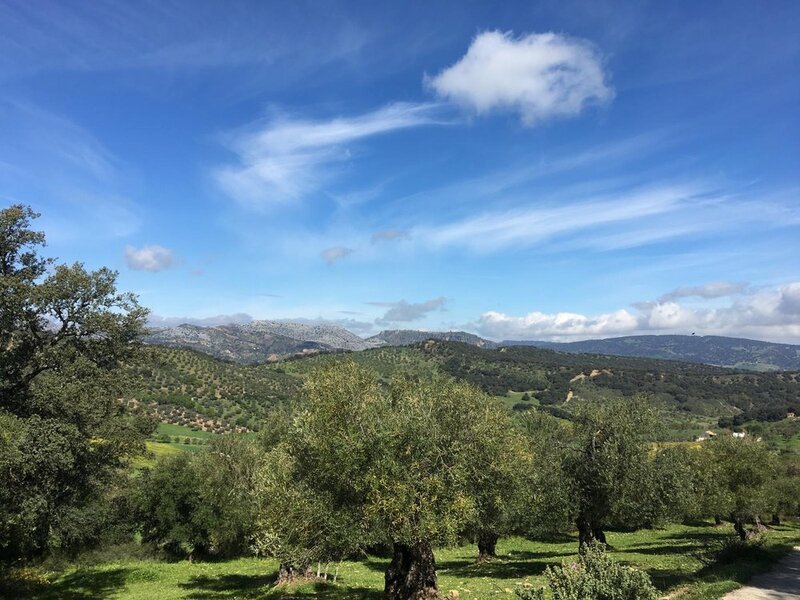 From the secluded track that leads to La Cazalla, you can pass by farms and olive groves up to the ridge separating Ronda from Benaoján and from there delight in the stunning views of Ronda and the Tajo del Abanico. There are only a couple of short steeper stretches before you are on your way downhill in the direction of Benaoján train station. As you descend, you can see the beautiful Cueva del Gato (the 'Cat's Cave'), and a visit to this limestone cave with prehistoric paintings and natural (but very cold!) freshwater pool can be incorporated into your hike. Alternatively, continue on to Benaoján, explore this pretty Pueblo Blanco, enjoy a delicious meal of traditional Spanish food at Restaurante Asador El Muelle (reservations recommended), and take the train back to Ronda just before 5pm. For those with plenty of energy, as it only takes 2-3 hours to walk there, you can skip the train and wander back to the house again. For easy navigation, we've logged this walk on our Wikiloc profile here, so simply download the hike and follow the route, enjoying the fantastic flora and fauna on the way. When you arrive at the top of the track leading to La Cazalla de Ronda, you will see a sign pointing to the right for the Ermita Rupuestre Virgen de la Cabeza: a 10th century hermitage. A walk to the ancient church provides absolutely spectacular views of Ronda and, if you visit in the springtime, a stunning display of wildflowers and almond blossom. 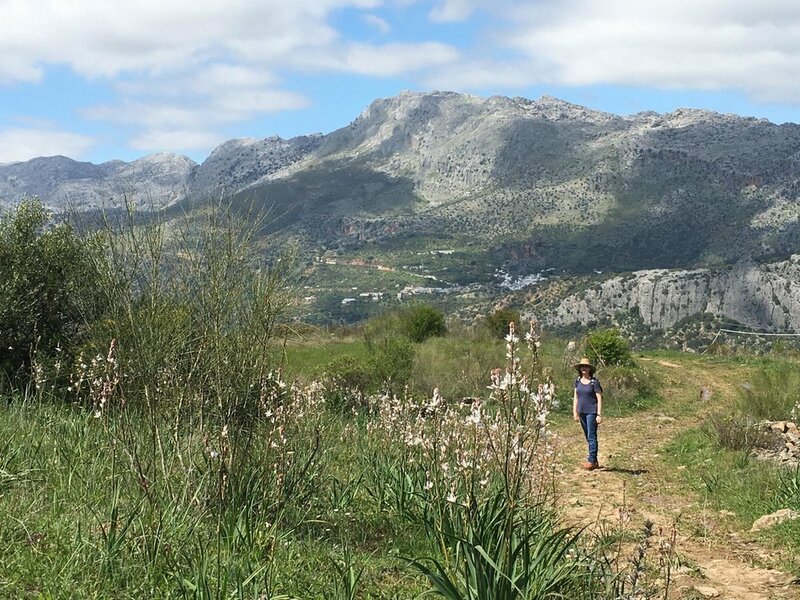 This gentle walk from the house takes just 2-3 hours, you'll hardly see a soul on the way, and the walk back downhill to La Cazalla provides wonderful views of the surrounding mountains. For those with a more sedentary holiday in mind, views of the gorgeous Gorge of the Fan (the Tajo del Abanico: named for its fan-shaped cave) can be appreciated from the house, but an easy 20 minute walk can take you from the house as far as an old threshing circle. For those wishing to explore further and see the cave, from here you head downhill on a cobbled path (the remains of a medieval road) and cross the narrow stream of the Sijuela at the bottom. The path bends to the right and here you will find the eponymous fan-shaped cave. Like the famous ‘Tajo de Ronda’, these cliffs are made of the rock known as ‘molasa’, which is formed of sand and other sedimentary materials. They have been moulded by water erosion, giving rise to formations such as the cave. According to legend, this is the place where the Roman army was ambushed and vanquished by Viriato, the resistance leader. What is certainly true is that this place has been the setting for several films and television series such as Curro Jiménez. The last film to be made here was Francisco Rosi's 1984 version of Bizet’s Carmen starring the famous tenor Placido Domingo. For a circular route that will take you around part of our stunning valley location, starting from the house and then ambling beneath the oaks opposite, you can download and follow our hike on our Wikiloc profile here. For visitors seeking a more serious hike, the above walk is actually part of the GR 141: the Great Trail of the Serranía de Ronda, and after visiting the fan-shaped cave, you can commence your longer trek to Alpandeire. The walk is well-marked and takes you through magnificent scenery, passing the Drunken Holm Oaks (so-named because the wind and cattle have caused them to drunkenly lean) and the Fuente del Espino, an old meeting-point for mule drivers, travellers and the “people from the mountains” (as smugglers, bandits and Maquis were known). Enjoy breathtaking mountain views of the Sierra Crestellina, the Reales de Sierra Bermeja, and the string of pueblos blancos on the ridge, and fully disconnect within the nature surrounding you. Take your binoculars for spotting vultures, eagles and other birds, and keep your eyes peeled for deer and wild boar. As you near Alpandeire you will be rewarded for your efforts with a beautiful view of this picturesque town with its towering church. We can then highly recommend having lunch at La Casa Grande before heading back to Ronda (either on foot or by taxi, if you've reached your limit for the day) to put your feet up with a sun-downer. 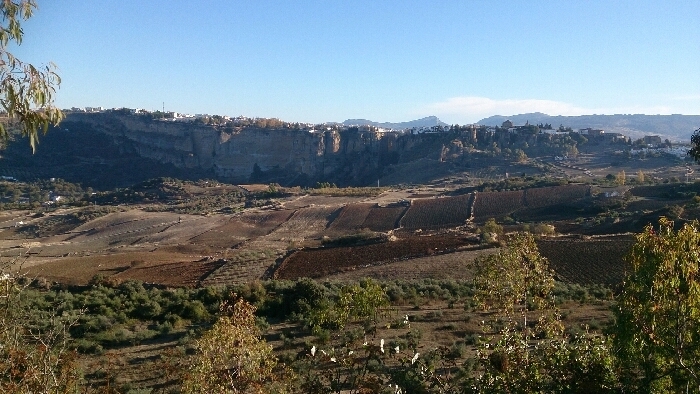 For this little wander of Ronda, you can either start from La Cazalla and walk up the track to Barrio San Francisco or, to save yourselves from the uphill start, drive into the Barrio, park, and start your walk from there. Beside the plaza (a perfect place to sit outside and have lunch) we start our walk at the Islamic Puerta de Almocábar, which in the 13th century was one of only two gates allowing access into the city. From the Almocábar Gate, turn right and head downhill towards the gas station (they sell great bread here!) instead of uphill into Ronda. From there you can admire the above view of the town before passing the gas station and taking the first small road on the left. This will take you below the city walls, through meadows that are filled with gorgeous wildflowers in the spring, towards the Baños árabes. 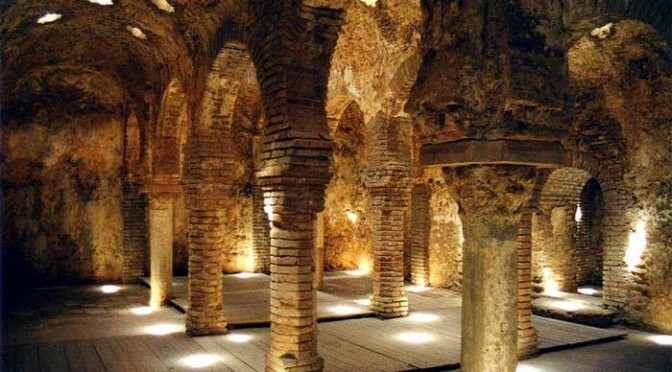 You will pass by the highly popular restaurant, Bar Casa Clemente, before arriving at the 13th century Arab Baths. The ruins are the best preserved in Spain and make for an interesting and informative short tour, after which you can view the Puente Nueve ('new bridge', completed in... 1793...) from the Puente Viejo (old bridge), and then turn back and head uphill directly across from the Baths into the city itself. The winding cobbled street will take you through the photographic Arco de Felipe V and through the older part of Ronda, with its interesting architecture, small stores and restaurants. At the top turn right and you will find yourselves at one of the most photographed bridges in Spain: the Puente Nuevo. Depending upon your need for food, libations or more sightseeing, you can then either choose to continue into Ronda and explore its bullring, plazas and parks, or head back down the hill to Barrio San Francisco, with the impressive Iglesia del Espiritu Santo on your left, and return to La Cazalla for a siesta by the pool. Starting again from Barrio San Francisco, this time take the Calle del Prado road immediately to the left of the roundabout by the plaza and follow it downhill towards the Carretera de los Molinos. 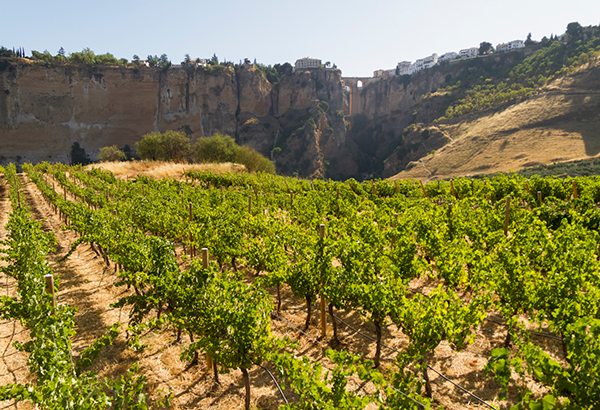 This road will take you through orchards and farms, and you can either take the first left after the houses to pass the Samsara Wines vineyard, or stay on the carretera to pass closer to the cliffs for panoramic views of Ronda and its famous bridge. Either route will take you to the bottom of the valley where you will cross the river Guadalevín - they both meet by the Hacienda Puerto de las Muelas. Shortly after the Hacienda, take the road to the right and head uphill, turning right again towards Bodega Descalzos Viejos. Tastings at both vineyards can be organised in advanced, if you would like to combine a little wine with your walk! At the top of the hill you will arrive in the city of Ronda close to the Plaza de la Península Ibérica. Turn to the right and join the Calle Jerez back towards the bullring and bridge. On the way down you will see the Iglesia de Nuestra Señora de la Merced Ronda on your right, home to holy relic the incorruptible hand of Saint Teresa of Avila and the nuns of Discalced Carmelites of Ronda (they have a superb bakery too!). Turning into the park on your right directly after the convent will take you away from the busy street to view the valley you have just walked, and you can follow the cliff-edge all the way back to the bridge. From there it's a short stroll downhill and back to the Barrio. As summer temperatures can be very high, we recommend planning to start your walks early, take plenty of water with you and dress for sun protection. Most bars and restaurants in Barrio San Francisco open at 2 pm, and we don't think it's such a bad idea to plan your walk to end at around that time for a well-deserved chilled beverage and a selection of tapas. We'll have another blog soon with our recommendations for restaurants, so stay in touch. If you have any questions about these walks or others within the region, don't hesitate to contact us, or simply learn about our latest rambles by following us on Wikiloc.